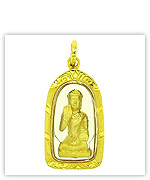 Gold Thai worship pendants (for necklaces) in this category are ordered from low prices to high prices. . . . . . . . .
Thai amulets (gold thai worship pendants) are shown below.